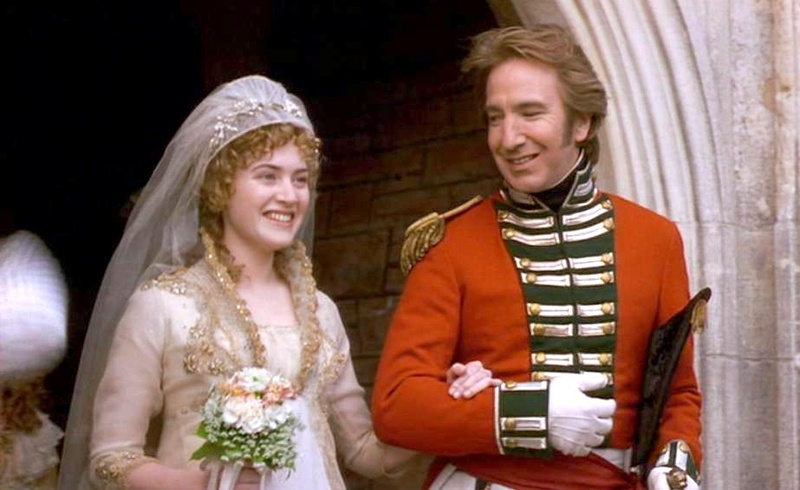 I’ve debated the question of who was the better Jane Austen hero between Mr. Darcy in Pride and Prejudice and Colonel Brandon in Sense and Sensibility many times and a lot of people think I only side with the colonel because he was played by my darling Alan Rickman in the movie but that’s not it at all. Having read the books before seeing the movies, I can tell you that the colonel would hold first place in my heart no matter who played the role. Here’s why: He loved Marianne Dashwood in a sincere, true way. He was never cruel to her nor did he ever insult either her intelligence, her beauty or her family. Even when she was set on being with another man- a man he knew wasn’t good enough for her- the colonel’s devotion didn’t waver and he wished her well in her choice. In the movie, Marianne is focused on Shakespeare’s sonnet 116 and she and Willoughby read it to each other and later, she recites it on the hill in the rain while overlooking his estate. I think it’s also the sonnet she makes Edward read at the beginning of the film (I haven’t watched in a while so I’m not 100% sure on that but I think so). Anyway, if you read the sonnet below, you see it was the colonel who all along met Marianne’s requirement for love, not Willoughby- The colonel’s love was an “ever fixed mark”; it looked on tempests and was never shaken; and bore it out to the edge of doom. I mean really, what could be more divine than to have a man love you like that? Another fun thing to share today is something that would probably not be believed if written in a novel. One of my friends from high school has a birthday today- Valentine’s Day. Her maiden name was Flowers and her family owns a florist. You can’t make that up, can you? Indeed we do, Michelle – even in Pirates!! It’s been a long time since I’ve read these stories. Maybe I need to pick them up again with this discussion in mind, eh? In the meantime, Happy Valentine’s Day! Yeah, Laurie, In your spare time, girl!! LOL! They are good stories. Very Nice! In every Jane Austen movie there comes a time when I stare at the book and say out loud,”If you don’t take him,I will!” but when I saw S&S and it was Alan Rickman,I nearly truly lost it! Happy Valentine’s Day,Jillian.